Ready for some fun? It’s time for another FLASH GIVEAWAY for the Month of July!!! 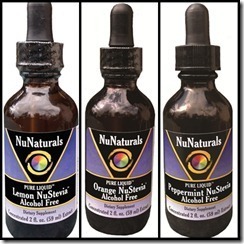 We are giving away NuNaturals Pure Liquid Flavored NuStevia. This stuff is fantastic. You can use it in cooking, beverages like coffee or tea plus there are LOADS of other uses. They are perfect for diabetic recipes and they are alcohol free. The peppermint is awesome in coffee! These products are far superior than any other Flavored Stevia products available, that some Mfg. use artificial flavorings to produce. Just like their most popular Vanilla Stevia Liquid that is made with PURE Vanilla Extract, their NEW products use REAL Lemon/Orange/Peppermint ingredients that we feel confident you will find most appealing & bursting with great flavor. You won’t believe the fantastic aroma when you open the bottle! The orange is divine. These products help you prepare healthier menu items WITHOUT SUGAR! 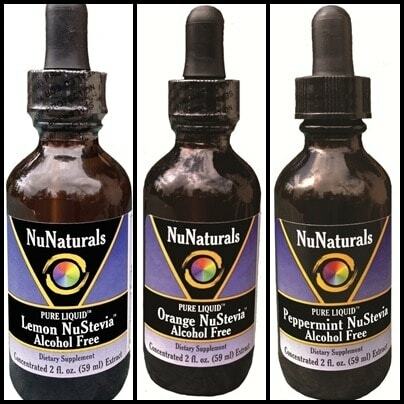 NuNaturals is giving away 3 bottles of alcohol free flavored stevia to FOUR** lucky readers! Use this DISCOUNT CODE : BLG1212 and receive – 15% DISCOUNT on your ENTIRE ORDER. I’ve joined some super awesome bloggers and hosts My Crafty Life and Full Price? Never! to bring these fun flash giveaways to you! We are tweeting at #SOFGiveaways all month long so keep your eye out and join the fun! Entering is simple on the Rafflecopter form below. This giveaway starts at 12:01am est on the 17th and ends at 11:59pm est on July 19th 2012! The participating bloggers were not compensated for this post. No purchase is necessary to enter. Void where prohibited by law. The odds of winning are based on the number of entries received. ** This promotion is no way sponsored, endorsed or administered by, or associated with, Facebook. ** To qualify to win, you must fill out the mandatory entry. Winners will be notified by email and will have 48 hours to respond. This giveaway is compliant with Facebook Rules! Must be aged 18+ to enter and win. Prize can only be mailed within the Continental US. No P.O Boxes. Full name, complete address and valid email address required.